I want to thank FrontRangeScribbles and Meeka’s Mind for the opportunity to nominate irresponsible, greedy mining companies and irresponsible, greedy politicians for the Golden Toilet Award. The G.O. and I spent a lovely Easter at our house in the rural village of Taylors Arm, on the Mid North Coast of NSW Australia, 500 kms from Sydney. The last 30 kilometre stretch from Macksville, the nearest town, is dotted with yellow signs on gates reminding us of the spectre of corporate mining, political interests and environmental devastation hanging over us. In April last year Precious Metal Resources Pty Ltd applied for a mining exploration licence, approved on 23rd November by the NSW Dept of Energy and Resources (Minister Chris Hartcher) for gold and antimony mining in the Nambucca Valley. The license covers an area of 330sq km in the areas around Taylors Arm, South Arm, Thumb Creek, Giralong, Burrapine and Buckrabendinni. It borders on the New England National Park and several state conservation areas. and information that John Dawkins, who was Treasurer and a Minister in the Keating Labor government, is on the Board of Precious Metal Resources Pty Ltd, I think we’ll need Kenny’s assistance with a fleet of Golden Toilets, otherwise the only thing our river water will be good for is flushing them. Wiki also notes “The largest applications for metallic antimony are as alloying material for lead and tin and for lead antimony plates in lead-acid batteries.” It’s worth bearing this in mind along with RoughSeas’ An Easter message which touches on consumerism, so that objections aren’t just NIMBYism. Does it really matter to me? This entry was posted in Blog and tagged antimony, Australia, award, environment, mining, my life, news, opinion, politics. Many Australians are concerned about coal seam gas mining, not in a NIMBY way but because real regulations & safeguards do not exist. The companies are not helping themselves. They have zero credibility. Residents in and around my local St Peters area are terrified and up in arms about plans to drill for coal seam gas in that suburb. Apparently plans for drilling in St Peters have been “dropped” but no-one really knows what that means. Obviously, alternative clean energy sources are an issue which needs to be addressed but coal seam gas mining isn’t about environment & sustainability, it’s about money, and it’s not clean. According to the Wilderness Society’s web page coal seam gas is emerging as a massive public issue.Pilliga: After an investigation by the Wilderness Society and local environment groups, coal seam gas company Santos has had to temporarily shut down the majority of their drilling operations in the beautiful Pilliga Forest after we exposed the significant pollution risks of coal seam gas mining. Santos have now publicly admitted to 20 hazardous events in the Pilliga forest, including a toxic spill of over 10,000 litres of untreated coal seam gas water. The ongoing spills, leaks and cover-ups taking place in the Pilliga Forest provide on-the-ground evidence of the serious risks involved in the coal seam gas industry. 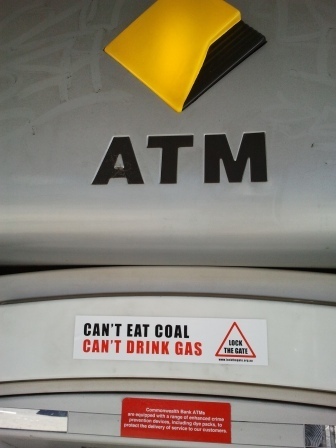 It is obvious that self-regulation by coal seam gas companies is failing. Kimberley: Buru Energy has recently commenced ‘tight gas’ fracking operations just 80km from Broome (Yulleroo field) without any environmental impact assessment – thanks to the WA EPA refusing to assess it. The EPA and WA Government Ministers claim that environmental assessment isn’t necessary because the industry is regulated by the WA Mines Department but this ‘regulation’ was recently exposed as a myth by the WA Auditor General. This entry was posted in Blog and tagged Australia, CSG, mining, opinion.